Buy oil press HPYL200 - Shandong Leader Machinery Co.,ltd. 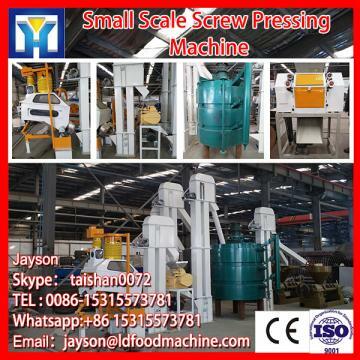 This hot sale oil seed press machine is the patented product improved by our factory,which is the more advanced in the veg. oil processing machinery, ith the characteristic of the simple structure, easy operation, energy saving, low noise, high rate of oil, adaptability and continuous operations. 1.High oil yield(the rate of the outlet oil i>93%),Residual oil of the cake is less, the crude oil is very clear. 2.The material quality of machine is best, the accssories are wear resistance and long service life after quenching conditioning treatment. 3.The gear box's gears adopts the special helical & coupling gear design, with the low load ,the less consumption and the low noise. 4. The bigger once pressing capacity ,which is the biggest in the once pressing machines . This hot sale oil seed press machine is suitable for physical Squeezing all kinds of vegetable oil material , such as soybean ,cottonseed , peanut, rapeseed, sunflower, teaseed , coconut dry ,Gendarmerie seed and palm kernel etc. For the whole oil press HPYL200,warranty is 12 months,within 12 months,if have equipment quality problems,we will provide accessories freely. After the expiration of the warranty period,if have spare parts problem,we only receive the cost of required replacement parts.We commit we will provide free technical support of equipment all whole life. Our company has engaged in producing and exporting oil press HPYL200 for many years, and until now, our machine has exported to overseas market, such as Brazil, India, Indonesia, Russia, Thailand and so on, and get the foreign customers' unanimous praise. We believe that you purchase Shandong Leader Machinery Co.,ltd. oil press HPYL200 is your best and sensible choice.